Add the onion, carrot and celery to the skillet and cook over moderate heat until tender, about 4 minutes, Add the five-spice powder and cook until fragrant, about 30 seconds. Stir in the water chestnuts, stock and hoisin sauce, scraping up the brown bits from the bottom of the pan. Return the pork to the skillet and stir-fry until heated through and coated with the sauce, about 1 minute. Remove from the heat and stir in the basil, scallions and sesame oil; season with salt and pepper. 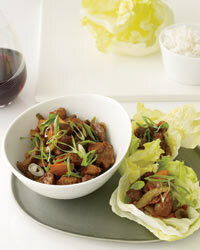 Spoon the pork into bowls and serve with lettuce leaves for wrapping. Pinot noir is the perfect varietal to pair with Chinese food. Its tannins and freshness help to degrease many fatty Chinese dishes. The Asian flavors such as sweet/spicy, earth-toned or mildly bitter Asian flavors for instance star anise, wasabi, hoisin, seaweeds, fennel, toasted sesame seeds, sesame oil, shiitakes, and even mild teriyaki marinades and glazes perfectly pair with our Pinot Noir. All of these can actually bring out the mildly sweet, zippy, toasty, earthy, and wonderfully beefy qualities of Pinot Noir, just as the wine can bring out the same qualities in the food. Small Vines’ Vigneron, Paul Sloan, hand selected our best barrels and crafted from obsessively tended vines. This precise cuvée marries our excellent estate vineyards together.